In a conference last year at the Mori Art Museum on the subject of internationalism in contemporary art, scholar Michio Hayashi theorized that the popular perception of “Japaneseness” in the West was cemented in the 1980s by triangulating “kitsch hybridity,” “primordial nature,” and “technological sophistication.” Today, popular (and especially commercially popular) contemporary art from Japan can still be placed somewhere inside that triangle. Two current shows in Chelsea, Duality of Existence – Post Fukushima at Friedman Benda and teamLab: Ultra Subjective Space at Pace Gallery’s two 25th Street locations, with their conceptions of dark and bright technological futures, certainly fit the formula. 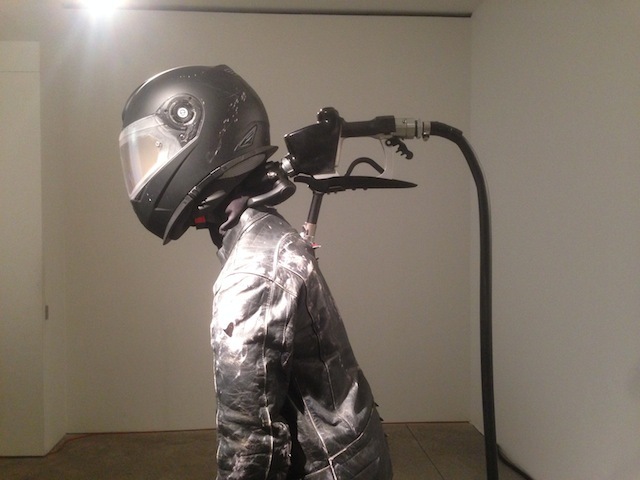 At the entryway of Duality of Existence, the visitor faces a mannequin in a motorcycle outfit, its opaque helmet visor turned into a screen showing a highway of light. Circling around the body, we see that the helmet is fed by a gasoline nozzle that falls to the floor. Though the sculpture, “Mediator” by Yusuke Suga, was made in 2013, it feels like something from the 1980s: the emphasis on the mechanical, early anime biker cool, body-as-machine. This sets the tone for the exhibition, which suggests that the nuclear disaster of Fukushima marked a crisis of faith in the demateriality of the internet and a return to hard physicality. The show was co-curated by Reiko Tsubaki of the Mori Art Museum (where last year’s triennial also focused on artistic responses to nuclear disaster pre- and post-Fukushima) and Thorsten Albertz of Friedman Benda. Kazuki Umezawa, following the techno-kitsch popularized by Takashi Murakami, creates digital renderings of anime characters like Sailor Moon thrown into wild, Boschian nether-spaces. He then stickers and paints on them to create further depth and visual chaos. 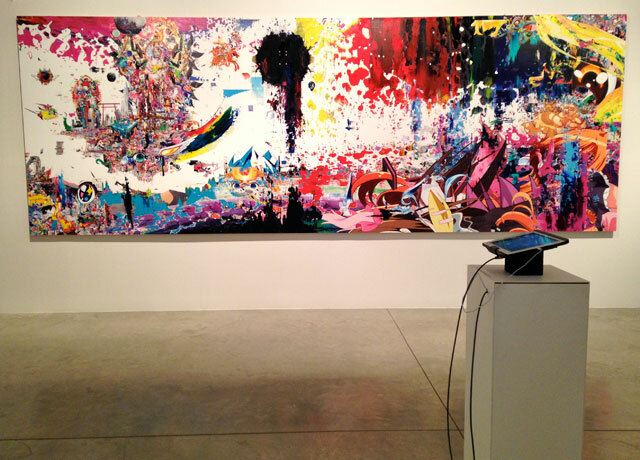 His most radical alteration to the canvas comes with “AR Image Core Involving All” (2013), in which the viewer points an iPad at the painting, showing an augmented reality animation of the pieces in the work trembling and then falling away. Quieter pieces fill the next few rooms: Motohiko Odani’s meditative two-channel video “A Dead Man Sleeping” (2013), which shows on one screen various objects falling into water in slow motion, then crashing and splintering, while on the other a single pendulum in water swings back and forth. The water, destruction, and memento mori are perhaps the show’s most direct reference to Fukushima. Odani also exhibits a suspended sculpture, a supposed “self-portrait study” from 2014, of watery filaments only vaguely suggesting a human head. This is complemented by Takahiro Iwasaki’s suspended classical Japanese building models reflected upside-down as if in a mirror, and delicately rendered in wood. The most cutting work in the exhibition comes from the collective Chim ↑ Pom, whose member Ellie was denied entrance to the US after faking answers on her visa form. In response, she reworks Joseph Beuys’s legendary “I Like American and America Likes Me” performance of 1974, in which he was taken from the airport to a gallery, where he spent three days trapped with a coyote, then immediately flew back to Germany. Ellie is not here: a laptop sits on a table and plays her recorded video chats with gallery staff and immigration specialists. 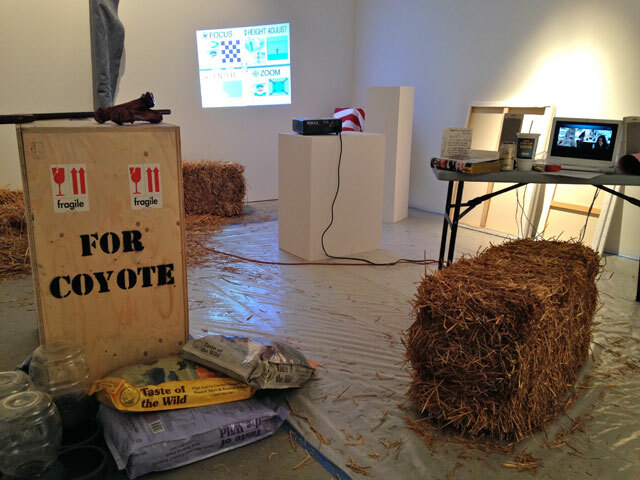 The room is decorated like Beuys’s, complete with straw, crates, and a roll of heavy gray felt. Ellie becomes both the dangerous coyote — also a play on the word for extralegal transporters of human bodies — and the innocent immigrant, omnipresent through the internet and a body stuck thousands of miles away. While faith in technological sophistication is questioned in Duality, it’s lavishly celebrated by teamLab and Pace a block away. 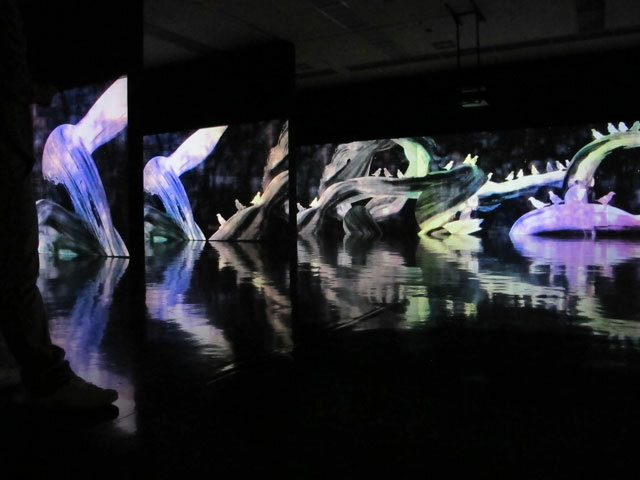 The centerpiece of the exhibition, a piece called “Crows are chased and the chasing crows are destined to be chased as well, Division in Perspective – Light in Dark” (2014), is a seven-projector, seven-screen spectacle installed alone in the larger gallery space. A digital animation follows the swerving flight of a series of crows, which leave contrails and splashing flowers in their wake. Not only are the multicolored birds and their intricate flights against a dark background mesmerizing, the “camera” in the imagined space circles and flies with them. The work, though, is spectacle without story, visual fireworks without emotional or mental stimulation. The background music recalls something like the introduction to an epic period movie, with key changes and heavy drums and swelling crescendoes. Much richer is the 12-panel digital screen installation “Flower and Corpse Glitch Set of 12” (2012). Like an unfolding handscroll, the work suggests a narrative across the panels but defies the traditional logic of a right-to-left reading. 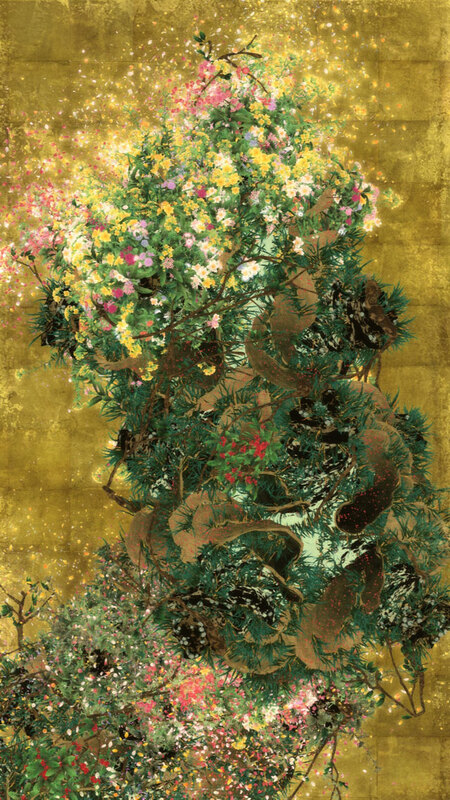 Each panel contains its own chapter of the mini-epic: we see dragons and armies of samurai, mountains that crumble and turn into digital grids, gold leafing assembling itself into new scenes — traditional Japanese painting motifs animated by dazzling high-definition digital. Though the loop is less than two minutes long, one could easily watch a single monitor several times. The whole spectacle is almost impossible to take in at once, a dizzying and immersive work. The other four works on view are quieter, not-quite-still lifes. Two show digital flower arrangements aging and regenerating; another, a small waterfall on floating boulders, the liquid a neon blue. One could easily see them as luxury items in one of the gallery’s client’s homes, a deluxe, highbrow version of the back-lit moving waterfall paintings of American kitsch. If we’re feeling cynical, we might call this phenomenon of kitsch and myth and technology a kind of Orientalism: looking to Japan to either rework Americana or to update their own future dystopias and epic pasts in palatable techno-glitter. 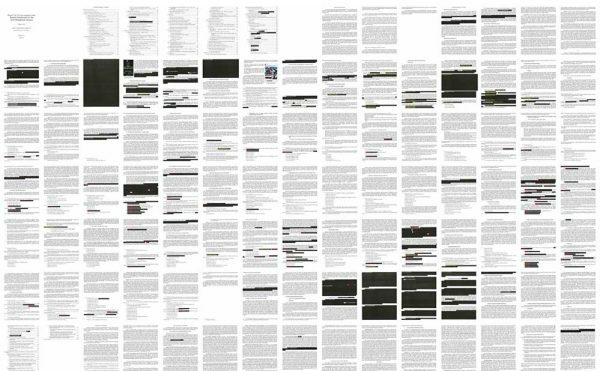 If we’re being generous, we may see this as art-as-translation, a way to learn something about a national psyche through the pleasures and displeasures of technology. Yet the artists of Duality of Existence express their worries about a crisis that is not just Japan’s but all of ours — one of environment and power — while teamLab revels in the same technologies that keep us glued to our phone and tablet screens, simply pushing the wonderment further. Perhaps these artists, and so many others we know from Japan, are legible through the lens of Hayashi’s triangle for a reason: great swaths of contemporary America sit within it, too. Duality of Existence – Post-Fukushima continues at Friedman Benda (515 W 26th Street, Chelsea, Manhattan) through August 8. teamLab: Ultra Subjective Space continues at Pace Gallery (508–510 W 25th Street, Chelsea, Manhattan) through August 15.